As in matters of speculation and philosophical inquiry, the only judge of what is right or wrong, is reason and experience; so in matters either of human testimony or divine Revelation, the only certain rule of truth is the testimony or the Revelation itself. The Christian Revelation, is the Doctrine of Christ and his Apostles; that is, the Will of Yahweh made known to mankind by Christ, and by those whom Christ entrusted with infallible authority to teach it. For the right apprehending of which Doctrine, men are (as in other matters of the greatest importance to them) sincerely to make use of their best understanding; and, in order thereunto, to take in all the helps they can find, either from living instructors or ancient writers; but this, only as a means to assist and clear up their own understanding, not to over-rule it; as a means to afford them light to see what Christ has taught them, not to prejudice them with supposing that Christ has taught anything, which after the strictest inquiry and most careful examination, they cannot find to be delivered in his Doctrine. If in all things which the Gospel declares absolutely necessary to be believed and practiced in order to Salvation, the Revelation of Christ was not in itself so clear, as that every sincere person, using the best helps and assistances he can meet with, might sufficiently understand it; it would follow, that Yahweh had not at all made sufficient provision for the Salvation of men. For the Doctrine of Christ and his Apostles being the only foundation we have to go upon, and no man since pretending to have had any new Revelation; it is evident there can never possibly be any authority upon earth, sufficient, to oblige any man to receive anything as of divine Revelation, which it cannot make appear to that man's own understanding. (sincerely studying and inquiring after the truth) to be included in that Revelation. For if any man can by any external authority be bound to believe anything to be the Doctrine of Christ, which at the same time his best understanding necessitates him to believe is not that Doctrine; he is unavoidably under the absurdity of being obliged to obey two contrary masters, and to follow two inconsistent rules at once. The only rule of Faith therefore to every Christian, is the Doctrine of Christ; and that Doctrine, as applied to him by his own understanding. In which matter, to preserve his understanding from erring, he is obliged indeed, at his utmost peril, to lay aside all vice and all prejudice, and to make use of the best assistances he can procure: but after he has done all that can be done, he must of necessity at last understand with his own understanding, and believe with his own, not another's Faith. For (whatever has sometimes been absurdly pretended to the contrary) it is evidently as impossible in nature, that in these things any one person should submit himself to another, as that one man should see or taste, should live or breathe for another. Wherefore in every inquiry, doubt, question or controversy concerning Religion, every man that is solicitous to avoid erring, is obliged to have recourse (according to the best of his capacity) to the rule itself, to the original Revelation. Using (as is before said) all the helps and assistances he can obtain: but still taking care to use them, only as helps and assistances: not confounding and blending them with the rule itself. Where that rule is to be found by every sincere Christian, is very evident. Whatever our Lord himself taught, (because His miracles proved His divine authority,) was infallibly true, and to us (in matters of religion) the rule of truth. Whatever His Apostles preached, (because they were inspired by the same spirit, and proved their commission by the like testimony of miracles,) was likewise a part of the rule of truth. Whatever the Apostles wrote, (because they wrote under the direction of the same spirit by which they preached,) was in like manner a part of the rule of truth. Now in the Books of Scripture is conveyed down to us the sum of what our Savior taught, and of what the Apostles preached and wrote. And were there as good evidence, by any certain means of tradition whatsoever, of any other things taught by Christ or His Apostles, as there is for those delivered down to us in these writings; it could not be denied but that such tradition would be of the same authority, and in every respect as much a part of the rule of truth, as the Scripture itself. But since there is no such tradition (and indeed in the nature of things there can be no such tradition) at this distance of time; therefore the Books of Scripture are to us now not only the rule, but the whole and the only rule in matters of Religion. This notion is well expressed by Irenaeus: we have not (saith he) been taught the method of our Salvation by any others, than by those from whom the Gospel itself was delivered to us: which the Apostles, at first, preached; and afterwards, by the Will of Yahweh, delivered down to us in writing, that it might be the foundation and pillar of our Faith. And it is impious to imagine, that they preached before they had perfect knowledge of what they were to deliver; as some who boast themselves to be amenders of the Apostles' Doctrine, have presumed to affirm. For after our Lord was risen from the dead, and they were endued by the holy spirit with power from on high; they were fully instructed, and had perfect knowledge in all things; and went forth into the ends of the world, declaring the good things which Yahweh hath provided for us, and preaching peace from Heaven unto men; having all and each of them the Gospel of Yahweh. Thus Matthew set forth the Gospel in writing, &c.
Nevertheless, though the whole Scripture is the rule of truth; and whatever is there delivered, is infallibly true; yet because there is contained in those writings great variety of things and many occasional doctrines and decisions of controversies, which though all equally true, yet are not all equally necessary to be known and understood by all Christians of all capacities; therefore the Church from the beginning, has out of Scripture selected those plain fundamental doctrines, which were there delivered as the terms or conditions of Salvation, of necessity to he known and understood by all Christians whatsoever. And these, all persons were taught in their Baptismal Creed: which was therefore universally called, the rule of faith: not that itself was of any authority, any otherwise than as it expressed the sense of Scripture; but that it was agreed to be such an extract of the rule of truth, as contained all the things immediately, fundamentally, and universally necessary to be understood and believed distinctly by every Christian. The Baptismal Creed, I say, must of necessity contain explicitly in it at least all the fundamentals of faith. Because whatever is fundamental, is necessary to Salvation; and it is a manifest absurdity, that anything should he necessary to the Salvation of a Christian, and yet not be expressly required to be explicitly believed by him at his Baptism, [or Confirmation,] when he is admitted into the Christian Church. For, to admit any person to be a member upon certain terms or conditions, and afterwards to alter or add to those terms, is what in other cases men never allow. But in process of time, as men grew less pious, and more contentious; so in the several churches they enlarged their Creeds and confessions of faith; and grew more minute, in determining unnecessary controversies; and made more things explicitly necessary to be understood; and (under pretence of explaining authoritatively) imposed things much harder to be understood than the Scripture itself; and became more uncharitable in their censures; and the farther they departed from the fountain of Catholic Unity, the Apostolical form of sound words, the more uncertain and unintelligible their definitions grew; and good men found no where to rest the sole of their foot, but in having recourse to the original words of Christ himself and of the spirit of truth, in which the wisdom of Yahweh had thought fit to express itself. For, matters of speculation indeed, of philosophy, or art; things of human invention, experience, or disquisition; improve generally from small beginning, to greater and greater certainty, and arrive at perfection by degrees; but matters of Revelation and divine testimony, are on the contrary complete at first; and Christian Religion, was most perfect at the beginning; and the words of Yahweh, are the most proper significations of His will, and adequate expressions of his intention; and the forms of worship set down in Scripture, by way either of precept or example, are the best and most unexceptionable manner of serving him. In the days of the Apostles therefore, Christianity, was perfect; and continued for some ages in a tolerable simplicity and purity of faith and manner; supported by singular holiness of life, by charity in matters of form and opinions, and by the extraordinary guidance of the spirit of Yahweh, the spirit of peace. holiness and love. But needless contentions, soon began to arise; and faith became more intricate; and charity diminished; and human authority and tem­poral power increased; and the regards of this life grew greater and of the next life less; and religion decayed continually more and more, till at last (according to the predictions of the Apostles) it was swallowed up in the great Apostacy. Out of which, it began to recover in good measure at the reformation; when the Doctrine of Christ and His Apostles was again declared to be the only rule of truth, in which were clearly contained all things necessary to faith and manners. And had that declaration constantly been adhered to, and human authority in matters of faith been disclaimed in deeds as well as in words; there had been, possibly, no more schisms in the Church of Yahweh; nor divisions of any considerable moment, among Protestants.
" I grant (says he) that proof derived from the authority of man's judgment, is not able to work that assurance, which doth grow by a stronger proof: and therefore, although ten thousand general councils should set down one and the same definitive sentence concerning any point of religion whatsoever, yet one demonstrative reason alleged, or one testimony cited from the, word of Yahweh Himself to the contrary, could not choose, but oversway them all inasmuch as for them to be deceived is not so impossible, as it is that demonstrative reason or divine testimony should deceive." "for men (says he) to be tied and led by authority, as it were with a kind of captivity of judgment: and though there be reason to the contrary, not to listen to it, but follow like beasts the first in the herd; this were brutish." "that the authority of men should pre­vail with men either against or above reason, is no part of our belief. Companies of learned men, though they be never so great and reverend, are to yield unto reason; the weight whereof is no whit prejudiced by the simplicity of the person which doth allege it: but being found to be sound and good, the bare opinion of men to the contrary must of necessity stoop and give place." And this he delivers, not only as his own particular judgment, but that which he apprehended to be the judgment of the Church of England. Thus far that excellent Archbishop. And the very learned and judicious Dr. Wake, (since the worthy successor of that great man:) 1 choose rather (saith he in the name of every Christian) to regulate my faith by what Yahweh hath delivered, than by what man hath defined. And the excellent Mr. Chillingworth: by the religion of Protes­tants (saith he) I do not understand the Doctrine of Luther, or Calvin, or Melancthon; nor the confessing of Augusta, or Geneva; nor the Catechism of Heidelberg; nor the Articles of the Church of England;; no, nor the harmony of Protestant confessions; but that wherein they all agree, and which they all subscribe with a greater harmony, as a perfect rule of their faith and actions; that is, the Bible. The Bible I say, the Bible only, is the religion of Protestants. Whatsoever else they believe besides it, and the plain, irrefragable, indubitable consequences of it; well may they hold it as a matter of opinion: but as matter of faith and religion, neither they, with coherence to their own grounds, believe it themselves; nor require the belief of it of others, without most high and most schismatical presumption, I, for my part, after a long and (as I verily believe and hope) impartial search of the true way to eternal happiness, do profess plainly, that I cannot find any rest for the sole of my foot, but upon this Rock only. I see plainly and with mine own eyes, that there are Popes against Popes, councils against councils, some fathers against others, the same fathers against themselves, a consent of fathers of one age against a consent of fathers of another age, the church of one age against the church of another age. Traditive inter­pretations of Scripture are pretended, but there are few or none to be found. No tradition, but only of Scripture, can derive itself from the fountain: but may be plainly proved, either to hate been brought in, in such an age after Christ: or, that in such an age it was not in. In a word, there is no sufficient certainty but of Scripture only, for any considering man to build upon. this therefore, and this only, I have reason to believe: this I will profess: according to this, I will live and for this, if there be occasion, I will not only willingly, but even gladly lose my life; though I should be sorry that Christians should take it front me. Propose me anything out of this book, and require whether I believe it or no; and seem it never so incomprehensible to human reason, I will subscribe it with hand and—heart: as knowing no demonstrative can he stronger than this; Yahweh hath said so, therefore it is true. In other things, I will take no man's liberty of judgment from him; neither shall any man take mine from me. I will think no man the worse man, nor the worse Christian: I will love no man the less for differing in opinion from me. And what measure I mete to others, I expect from them again. I am fully assured that Yahweh does not, and therefore that men ought not, to require any more of any man than this; to believe the Scrip­ture to be Yahweh's word, to endeavor to find the true sense of it, and to live according to it. Again: let all men (saith he) believe the Scriptures, and that only, and endeavor to believe it in the true sense, and require no more, of others; and they shall find this, not only a better, but the only means to suppress heresy, and restore unity. For he that believes the Scripture sincerely, and endeavors to believe it in the true sense, cannot possibly be a Heretic. And if no more than this were required of any man, to make him capable of the Church's Communion; then all men so qualified, though they were different is opinion, yet, notwithstanding any such difference,, must be of necessity one in Communion. And again: Certainly if Protestants he faulty in this matter, [in the question about the extent of human authority,] it is for doing it too much, and not too little. This presumptuous imposing of the senses of men, upon the words of Yahweh; the special senses of men upon the general words of Yahweh; and laying them upon men's consciences together, under the equal penalty of death and damnation, this vain conceit, that we can speak of the things of Yahweh, better in the words of Yahweh: this defying our own interpretations, and tyrannous enforcing them upon others: this restraining of the word of Yahweh from that latitude and generality, and the understandings of men from that liberty, wherein Christ and the Apostles left them; is and hath been the only fountain of all the Schisms of the Church , and that which makes them continue the common incendiary of Christendom: and that which tears into pieces, not the coat, but the bowels and members of Christ, to the great satisfaction of Jews and Infidels. Take away these walls of separation. and all will quickly be one: take away this persecuting. burning. cursing, damning of men, for not subscribing to the words of men as the, words of Yahweh: require of Christians, only to believe Christ, and to call no man master but Him only: let those leave claiming infallibility, that have no title to it; and let them that in their words disclaim it, disclaim it likewise in their actions: and—it may well be hoped by Yahweh's blessing, that—it may quickly reduce Christendom to truth and unity. These thoughts of peace, I am persuaded may come from the God of peace, and to his blessing I commend them. And the learned Stillingfleet: without all controversy, (saith he,) the main inlet to all the distractions, confusions, and divisions, of the Christian world: hath been by adding other conditions of Church communion than Christ has done. And the excellent Mr. Hales: it hall been (saith he) the common disease of Christians from the beginning, not to content themselves with that measure of faith, which Yahweh and the Scriptures have ex­pressly afforded us; but out of a vain desire to know more than is revealed, they have attempted to discuss things, of which we can have no light, neither from reason nor revelation. Neither have they rested here; but upon pretence of Church authority, (which is none,) or of tradition, (which for the most part is but figment,) they have peremptorily concluded, and confidently imposed upon others, a necessity of entertaining conclusions of that nature; and to strengthen themselves, have broke out into divisions and factions, opposing man to man, and synod to synod, till the peace of the Church vanished without all possibility of recall. Hence arose those ancient and many separations among Christians, occasioned by Ariauism, Eutychianism, Nestorianism, Photinianism, Sabellianism, and many more both ancient and in our time all which indeed are but names of Schism, howsoever in the common language of the fathers they were called heresies. For heresy is an act of the will, not of reason; and is indeed a lie, not a mistake: else how could that known speech of Austin go for true, I may err, but 1 will not be a Heretic? Indeed Manichaeism, Valentinianism, Marcionism, Mahometanism. arc truly and properly Heresies: for we know that the authors of them received them not, but minted them themselves; and so knew that which they taught to be a lie but can any man avouch, that—others that taught erroneously,—did maliciously invent what they taught, and not rather fall upon it by error and mistake? In the statutes given by Queen Elizabeth of glorious memory, to Trinity College, in the University of Cambridge, the following oath is appointed to be taken by every fellow in the Chapel, before his admission. I, do swear and promise in the presence of Yahweh, that I will heartily and steadfastly adhere to the true religion of Christ, and will prefer the authority of Holy Scripture before the opinions of men; that I will make the word of Yahweh the rule of my faith and practice, and look upon other things, which are not proved out of the word of Yahweh, as human only;—that I will readily and with all my power oppose doctrines contrary to the word of Yahweh; that, in matters of religion, 1 will prefer truth before custom, what is written before what is not written. &c.
And, in the same University. every Doctor in Divinity, at his taking that Degree, does make his profession in the following words: In the name of Yahweh, Amen: 1, do from my heart receive the whole sacred canonical Scriptures of the Old and New Testament: and do hold, or reject, all that the true, holy, and Apostolical Church of Christ, subject to the word of Yahweh, and being governed by it, holds or rejects: and in this Profession I will persevere to my life's end, Yahweh of his great mercy giving me grace, through Jesus Christ our Lord. And every Priest at his ordination, [and Bishop at his consecration] being solemnly asked, are you persuaded that the Holy Scriptures contain sufficiently all doctrine required of necessity to eternal salvation through faith in Jesus Christ? And are you determined out of the same Holy Scriptures, to instruct the people committed to your charge, and to teach [or maintain] nothing as required of necessity to eternal Salvation, but that which you shall be persuaded may be concluded and proved by the Scripture? Answer in the following words: I am so persuaded. and have so determined by Yahweh's grace. And the whole Church of England, in the 6th, the 20th, and 21st of the 32 Articles, declares; that Holy Scripture contains all things necessary to salvation: so that whatsoever is not read therein, nor may be proved thereby, is not to be required of any man, that it should be believed as an article of the faith, or be thought requisite or necessary to salvation, that it is not lawful for the Church to ordain anything that is contrary to Yahweh's word written: neither may it so expound one place of Scripture, that it be repugnant to another: Wherefore, although the Church be a witness and a keeper of Holy writ, yet as it ought not to decree anything against the same, so besides the same ought it not to enforce any thing to he believed for necessity of Salvation; that even general councils,—(forasmuch they be an assembly of men, whereof all be not governed with the spirit and Word of Yahweh) may err, and sometimes have erred, even in things pertaining unto Yahweh: wherefore things ordained by them. as necessary to Salvation, have neither strength nor authority, unless it may be declared that they be taken out of Holy Scripture. The plain meaning of these and many other the like declarations to be found in our best writers, is not that matters of form, decency, and order, are not to be appointed and settled by lawful. authority, (without which there can be no visible and public Communion of Christians;) nor that, in matters of Faith, it can in any wise be excusable for men loosely and wantonly to run after enthusiastic imaginations; much less, that there is not perpetual need of living guides and instructors in the Church of Yahweh, and of constant helps and directions, for the perfecting of the Saints. for the work of the Ministry, for the edifying of the Body of Christ. But the meaning is, that it is the duty, and in the power, of every particular Christian, by and with the use of all those helps and assistances which the Divine Providence has afforded him; soberly, and in the fear of Yahweh, to judge of, and to understand for himself, whatever is necessary for his own Salvation and that it is the great (lay of Christian guides and instructors. especially of those in power and authority, to employ their utmost care and abilities, not in obliging men to receive things implicitly, but in assisting them to perceive and apprehend with their own understandings, what are the things which Yahweh has required of them to believe and practice. 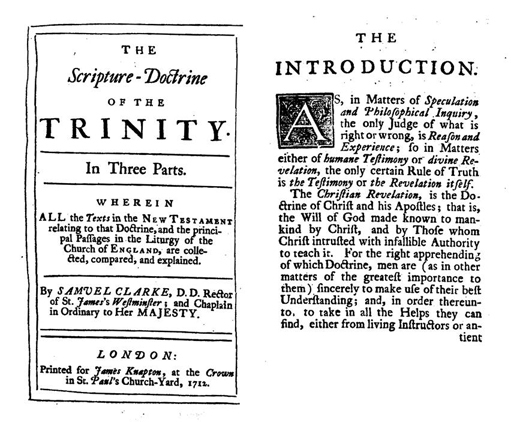 To apply this general Doctrine (which is the great foundation of the Protestant and of the Christian Religion) to the controversies which have been raised in particular, with too much animosity and uncharitableness, concerning the manner of explaining the Scripture Doctrine of the Trinity; I have in the first part of the following treatise, (that it might appear what was, not the sound of single Texts which may be easily mistaken, but the vilely Tenor of Scripture,) collected every Text in the New Testament relating to that matter, (which I am not sensible has been done before,) and set then, before the reader in one view, with such references and observations. as may (it is hoped) be of considerable use towards the understanding of their true meaning. In the second part, is collected into methodical propositions the sum of that Doctrine, which (upon the carefullest consideration of the whole matter) appears to me to be fully contained in the Texts cited in the first part. And I have illustrated each proposition with many testimonies out of the ancient writers, both before and after the Council of Nice; especially out of Athanasius and Basil; among which, are several not taken notice of either by Petavius, or the learned Bishop Bull. Concerning all which, I desire it may be observed, that they are not alleged as proofs of any of the propositions; (for proofs are to be taken from the Scripture alone,) but as illustrations only; and to show how easy and natural that notion must be allowed to be, which so many writers could not forbear expressing so clearly and distinctly, even frequently when at the same time they were about to affirm, and endeavoring to prove some things not perhaps very consistent with it. The greatest part of the writers before and at the time of the Council of Nice, were, (I think,) really of that opinion, (though they do not always speak very clearly and consistently) which I. have endeavored to set forth in those Propositions. But as to the writers after that time, the reader must not wonder, if many passages not consistent with (nay, perhaps contrary to) those which are here cited, shall by any one be alleged out of the same Authors. For I do not cite places out of these latter Authors, so much to show what was the opinion of the writers themselves, as to show how naturally truth sometimes prevails by its own native clearness and evidence, even against the strongest and most settled prejudices; and how men are frequently compelled to acknowledge such premises to be true, as necessarily infer a conclusion different from what they intend to establish. According to that of Basil; am persuaded (saith he) that the strength of the Doctrine delivered down to us, has often compelled men to contradict their own assertions. In the third part there is, first, brought together a great number of passages out of the present Liturgy of the Church of England, wherein the Doctrine set forth in the former parts is expressly affirmed; and then in the next place are collected the principal passages, which may seem in their literal and most obvious sense, to differ from that Doctrine; which latter, must needs be understood in such a sense only, as is agreeable to the former, by every one, who when he uses those forms with his mouth, desires to pray with his understanding also. It is a thing very destructive of Religion, and the cause of almost all divisions among Christians; when young persons at their first catering upon the study of Divinity, look upon human and perhaps modern forms of speaking, as the rule of their Faith; understanding these also according to the accidental sound of the words, or according to the notions which happen at any particular time to prevail in the World; and then picking out (as proofs) some few single texts of Scripture, which to minds already strongly prejudiced must needs seem to sound, or may easily be accommodated the same way; while they attend not impartially to the whole scope and general tenor of scripture. Whereas on the contrary, were the whole Scriptures first thoroughly studied, and seriously considered, as the rule and only rule of Truth in matters of Religion; and the sense of all human forms and expressions, deduced from thence; the greatest part of errors, at least the greatest part of the uncharitable divisions that have happened among Christians, might in all probability have been prevented. The different states which the controversies concerning Predestination, Original Sin, Infant Baptism, Justification, Free-will, Faith and good Works, and the doctrine of the ever blessed Trinity, have at different times gone through; are a sufficient evidence of this truth. The Church of Rome indeed, (that great human authority sitting in the Seat of God) requires men to receive her particular Doctrines (or explications of Doctrines) and Traditions, not as human and fallible Determinations, to be perpetually compared with, and examined by the infallible rule; but as being part of the rule itself of their Faith. But the Protestant Churches, utterly and solemnly disclaim all such authority; and require men to comply with their respective forms, upon no other ground but that of their being agreeable to Scripture; and consequently in such sense only, wherein they are agreeable to Scripture. The first Reformers, when they had laid aside what to them seemed intolerable in the Doctrines of the Church of Rome, in other matters chose to retain the words which they found in use in that Church; yet declaring that they meant thereby to express only the sense of Scripture, and not that of Tradition, or of the schools. If Tradition or custom, if carelessness or mistake, either in the com­piler or receiver happen at any time to put a sense upon any human forms, different from that of the Scripture, which those very forms were intended to explain, and which is at the same time declared to be the only rule of Truth; it is evident no man can be bound to understand those forms in such sense; nay, on the contrary, he is indispensably bound not to understand or receive them in such sense. For (as the learned Mr. Thorndike rightly observes) that which once was not matter of Faith, can never by process of time, or any act the Church can do, [or by any interpretation of words, that custom or carelessness or contentiousness may have introduced)] become matter of Faith. As, in reading a comment upon any book whatsoever, he that would thence understand the true meaning of the Text, must not barely consider what the words of the comment may possibly of themselves happen most obviously to signify; but how they may be so understood, as to be a consistent interpretation of the Text they are to explain: so in considering all forms of human composition in matters of Religion, it is not of importance what the words may in themselves possibly most naturally signify, or what they may vulgarly and carelessly be understood to mean; (for there is in almost all words, some ambiguity;) but in what sense they can be consistent expositions of those Texts of Scripture, which they were intended and are professed to interpret. Otherwise it may easily (nay, it will frequently) happen, that a comment shall in effect come into the place of the Text, and another interpretation afterwards into the place of that comment; till in process of time, men by insensible degrees depart entirely from the meaning of the Text, and human Doctrines swallow up those which are divine. Which evil can no otherwise be prevented, than by having recourse perpetually to the original itself; and allowing no authority to any interpretation, any further than it is evidently agreeable to the Text itself. A very eminent historical instance of this sort, is to be found in the life of the late Right Reverend Bishop Bull, written by Robert Nelson, Esq., from page 97 to 257: where there is an exact account given, what method that learned Writer took to explain the Doctrine of Justification; (viz., the very same and only method, which ought to be taken in explaining all other Doctrines whatsoever:) how zealously he was accused by many systematical divines, as departing from the Doctrine and Articles of the Church in what he had done; how learnedly and effectually he defended himself against all his adversaries; and how successful at length his explication was, in being after some years almost universally received. But not to mention many examples of this kind, in almost all the confessions of faith that ever were published; there is one very re­markable instance of it, in the Apostles' Creed itself. The word, hell, in the present common use of the English language, signifies always, the place or state of the damned; and every vulgar English reader, when he professes his belief that Christ descended into hell, is apt to understand the article, as signifying Christ's descending into the place of the damned: And probably they who first put the article into the Creed, in the fourth century, might mean and intend it should be so understood. Nevertheless, since all learned men are satisfied, that the Greek word in those texts of Scripture upon which this article was founded does not signify hell, but in general only the invisible place, into which the souls of those departed out of this world are conveyed; they now with great reason think themselves obliged to understand it in the Creed, not as the word may in modern speech seem to sound to the vulgar, but as it really signifies in the original texts of Scripture. The same is to be understood of every part of all human compo­sitions whatsoever. According to that excellent observation of the learned Bishop Pearson: I observe (saith he) that whatsoever is delivered in the Creed, we therefore believe, because it is contained in the Scriptures; and consequently must so believe it, as it is con­tained there. Whence all this exposition of the whole, is nothing else but an illustration and proof of every particular part of the Creed, by such Scriptures as deliver the same, according to the true interpretation of them. And the whole Church of England has made the like declaration, in the sixth, the twentieth, and twenty-first of the thirty-nine articles, before cited; and in the eighth article, which declares that the Creeds ought to be received and believed, because (and consequently only in such sense wherein) they may be proved by most certain warrants of Holy Scripture. In what sense the most difficult passages in the Liturgy concern­ing the doctrine of the Trinity, are to be understood, agreeably to the doctrine of Scripture, may (I presume) best be gathered, by comparing them with all the texts of Scripture collected together, relating to that point. And (as I think the sincerity of a Christian obliges me to declare,) I desire it may be observed, that my assent to the use of the forms by law appointed, and to all words of human insti­tution, is given only in that sense wherein they are (according to the explications given in the several parts of this book) agreeable to that which appears to me (upon the most careful and serious consideration of the whole matter) to be the doctrine of Scripture; and not in that sense which the Popish schoolmen, (affecting, for the sake of Tran­substantiation, to make everything look like a contradiction,) en­deavored to introduce into the Church. are the three great articles of our Creed. And in maintaining these rightly, so as seriously to affect meet's understandings, and influence their lives accordingly, is the honor of Yahweh, and the interest of true religion greatly concerned. Tritheism, Sabellianism, Arianism, Socinianism, and the like, have, to the great disparagement of Christianity, puzzled the plain and practical doctrine of Scripture, with endless speculative disputes. And it has been no small injury to Religion, in the midst of those disputes,—that as on the one hand, men by guarding unwarily against Tritheism, have often in the other extreme run into Socinianism, to the diminution of the honor of the Son of Yahweh, and to the taking away the very being of the holy spirit; so on the contrary, incautious writers, in their zeal against Socinianism and Arianism, have no less frequently laid themselves open to Sabellianism or Tritheism, and to the greatest confusion and most unintelligible obscurity in the worship of Yahweh, by neglecting to maintain the honor and supremacy of the Father. The design of the following papers is to show how this evil may be prevented, and in what manner both extremes may rationally be avoided. Nor can the avoiding one of these extremes be esteemed by considerate persons of less importance than the other. For, the same pious disposition of mind, which makes serious persons careful not to diminish the honor of the Son of Yahweh, and of his holy spirit, ought certainly to render them at least as solicitous, not to diminish the singular and supreme honor of Yahweh, the Father himself; of whose alone grace and mercy it is, that his Son was given for their redemption, and his spirit for their sanctification, There are others who have thought that we ought not at all to treat concerning any of these matters, because they are mysterious. By which if they meant, that so far as the words of Yahweh are mysterious, we ought to acquiesce in them implicitly, and not pre­sume to be wise beyond what is written; no man could say that herein they judged amiss. But if they mean, that the words of men are mysterious, and that we must not reason concerning them, nor inquire whether or no, and in what sense, they are agreeable to the words of Yahweh; what is this, but substituting another mystery in the stead of the true one; and paying deference to the mystery of man's making, instead of the mystery of Yahweh? The true veneration of mysteries consists, not in making them ourselves, and in receiving blindly the words of men without understanding them; but it con­sists, either in taking care there to stop, where the Scripture itself has stopped, without presuming to go further at all; or else, in taking care to understand all words of human institution in such a sense, as that they be sure to signify neither more nor less than the words of Scripture necessarily and indisputably do. Whosoever puts any meaning upon words of human institution, which does not appear to another (upon his sincerest and most careful examination) to be the same with the sense of the words of Scripture, must not complain that the other opposes his own reason to the authority of Yahweh, when indeed he opposes it only to those who would make human authority the same with divine. Affecting to speak unintel­ligibly, where the Scripture itself has not done so, is indeed pro­moting scepticism only, not true religion. Nor can there be any other so effectual a way of confuting all heresies, as it would be to restrain men within the bounds of the uncontested doctrine of Scrip­ture; and give them as few advantages as possible, of raising objec­tions against human and fallible forms of speaking. Lastly; as to those who, in the whole, are of opinion that every man ought to study and consider these things according to ability; and yet, in the particulars of the explication, have quite different notions from those which I have thought reasonable a necessary to set forth in the following papers; I have, with regard such persons as these, endeavored to express myself with all modesty and due submission. And if any leaned person, who thinks me in an error, shall in the spirit of meekness and Christianity propose a different interpretation of all the texts I have produced, a deduce consequences therefrom, different from those which seem me unavoidably to follow; I shall think myself obliged, either return him a clear and distinct answer in the same spirit of meekness and candor, or else fairly and publicly to retract whatsoever is not capable of being so defended. But if, on the contrary, a nameless and careless writer shall, in the spirit of Popery, contend only that men must never use their own understandings, that is must have no religion of their own; but, without regarding what right or wrong, must always plead for what notions happen at any time to prevail; I shall have no reason, in such case, to think myself under the same obligation of answering him. It is the great and indeed of all others the most fatal calamity in the Church of Rome, that while the people think they cannot but be very safe in following the unanimous opinion of such numbers of very learned men, those learned men are not, in truth, at liberty to have any opinion at all; but are obliged to employ all their learning, merely in defending what the most ignorant men in former ages have determined for them beforehand.